Every time I run across work by Atlanta architect Bobby McAlpine it just blows my socks off. 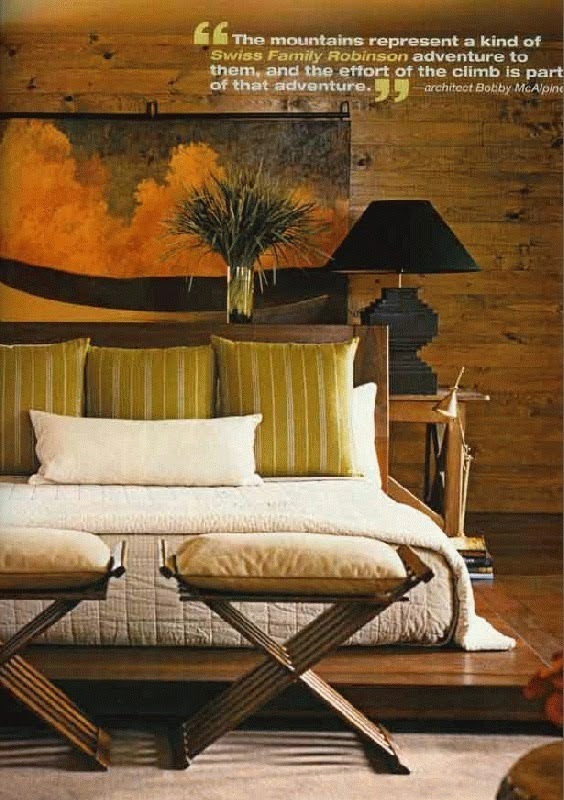 I have a thick file of magazine tear sheets featuring his work and every single house is fabulous. 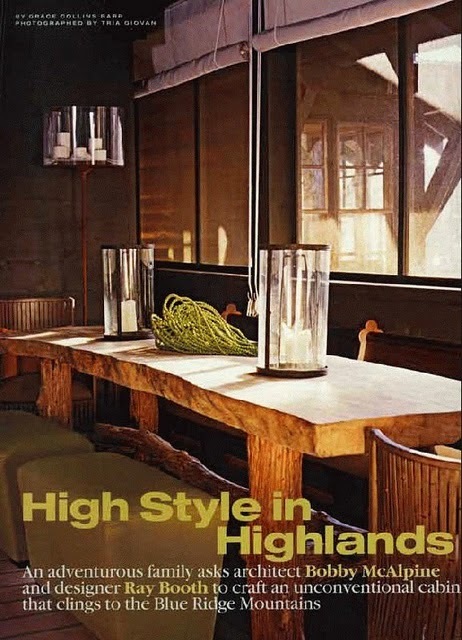 Recently I was doing a little sorting in my office and ran across an article I had pulled out of an issue of Southern Accents Magazine called "High Style in Highlands". 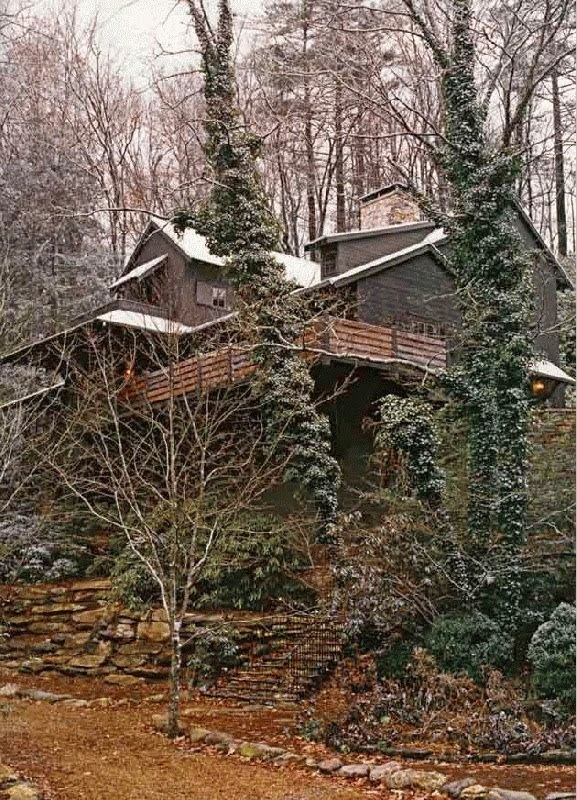 It features a house McAlpine built for clients in the Blue Ridge Mountains. McAlpine often works with designer Ray Booth who is a partner in his firm. 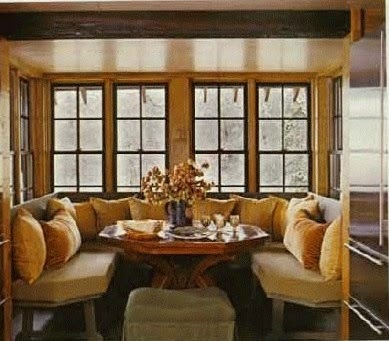 Booth did the interiors on this project. The interiors in this house manage to mix contemporary and rustic in such a beautiful way. The lines are clean, the materials are mountain-appropriate and the scale is big. As in all the firm's designs, there is an easy elegance to the rooms and great attention has been paid to comfort and livability. 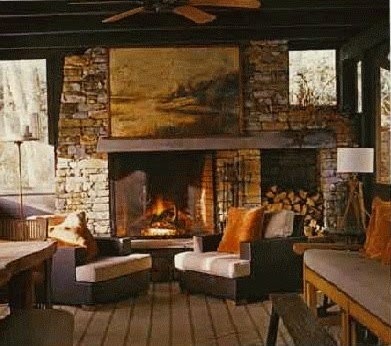 Above, the stunning fireplace on the screened-in porch. Above, the great room has space for living, dining and even library...walls of bookshelves are behind curtains next to the table. The large table is the perfect place to pull out a laptop or a game of scrabble. 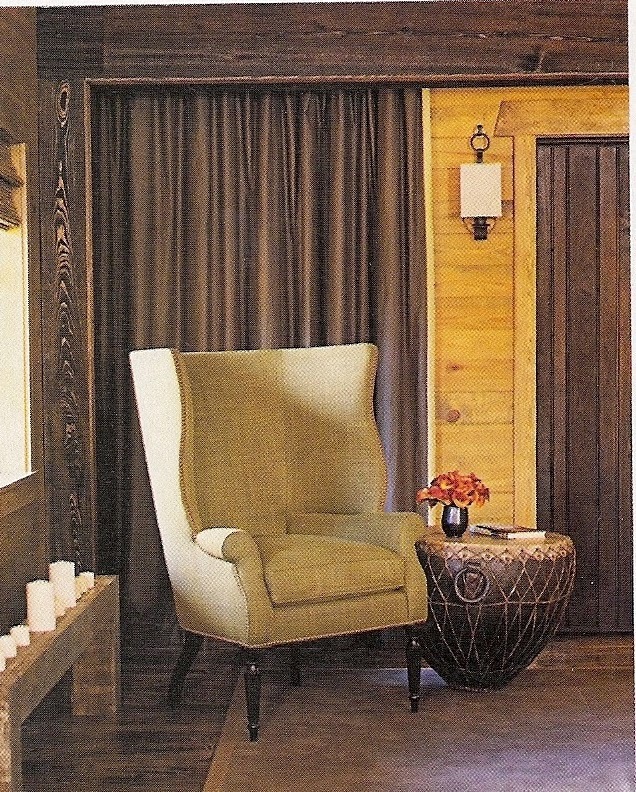 One interior detail I love is the wood siding boards stacked horizontally. This seems so modern and is something you rarely see here in Lake Tahoe where old pickwick pine was traditionally used vertically. We are still using it a lot today and clients often ask to create an "Old Tahoe" look. 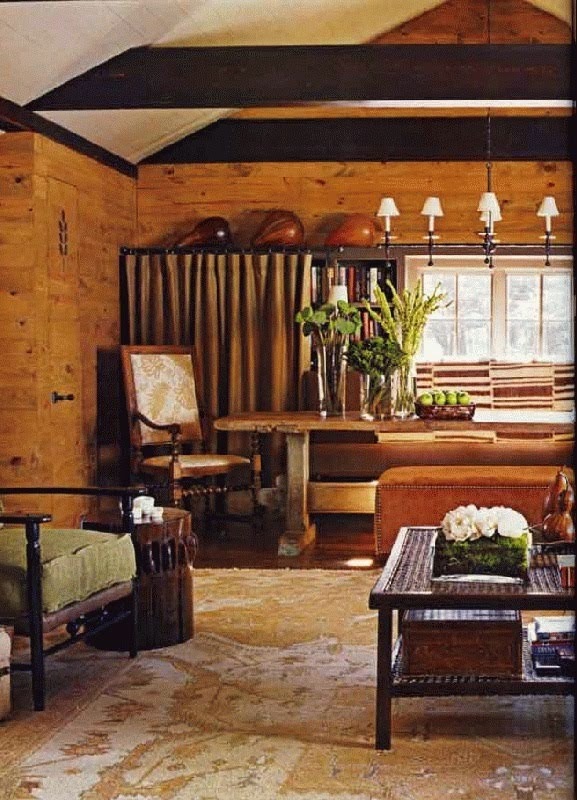 Also, in Tahoe, beams were stained dark like this in the 60's and 70's and I often get clients asking me how to lighten them up to make them look current. Usually in our 60's interiors, though, the ceilings are clad with wood and the walls are dry wall (and would have been painted white, to match the orange shag carpets and orange formica countertops). I love the way McAlpine has switched up the look...the dark beams actually look fresh and modern here against the white ceiling and horizontal wood walls. If you look closely at the McAlpine interior furnishings, you'll see that there is a great deal of complexity in the work. In every vignette they've brought in some special object from the past like the church pew serving as a bench for the dining table on this outdoor porch, below. Old meets modern meets rustic, setting up subtle design tension. The rooms these two create together are not just beautiful, they are always intriguing. The kitchen is just simply stunning. 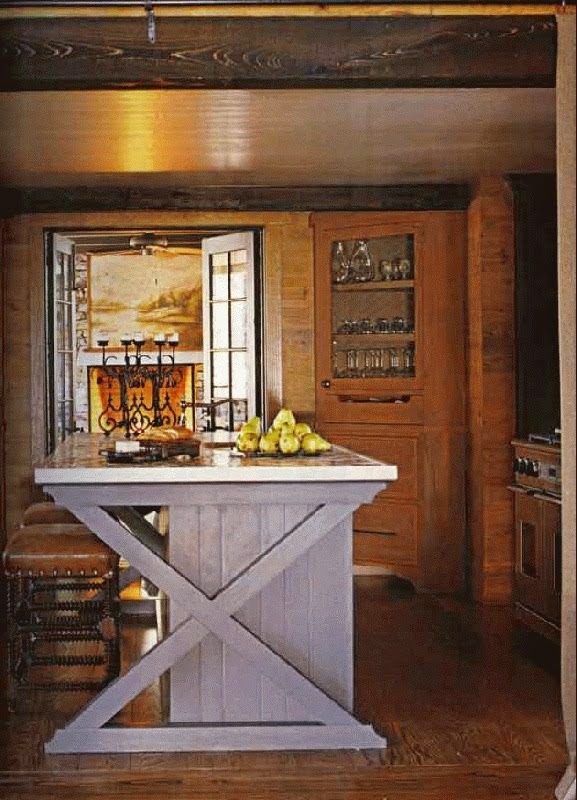 I love the x detailing on the island, and the light grey stain really pops in the midst of an all wood space. I love this sophisticated breakfast nook, the comfortable but understated pillows, the details on the custom banquette legs, they greyed stain on the wood, the gorgeous table, the use of an ottoman at the head of the table...the whole thing is so inviting, and sooo handsome!